Photos by John Burkill, no reproduction without permission. 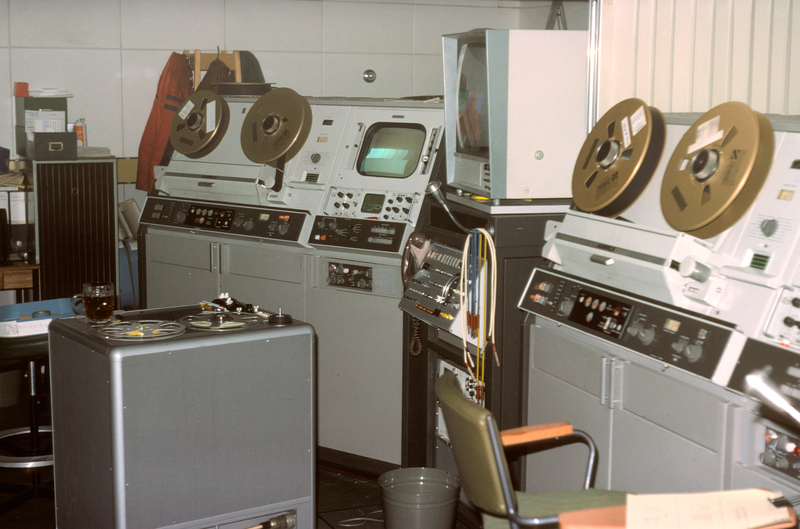 These photos date from 1976, and show Ampex VR2000 2″ editing machines in VTB, with a 1/4″ machine between them for lifting off the audio when about to make an edit. In the top photo there is a 2″ editing block, used for cutting and splicing the tape. This was a difficult process, involving a microscope and iron filings, and just to complicate matters the audio and video were on different parts of the tape. In both photos there is the obligatory VT pint of beer – meaning that the photos were probably taken after or during lunch! Keith Brook: Lannin was the edit-block hero. Iron ‘powder’ was used to ‘see’ the frames, and thus the edit points. The beer was needed to wash down those particles that were inhaled. Apparently, water didn’t work at all. This was obviously a long edit because the beer’s flat. Stuart Gandy: Lubrication of the working parts was essential in these machines. Beer was found to be the perfect substance. Steve Saunderson: Can’t identify the machine, but it looks like a pint of Ruddles. 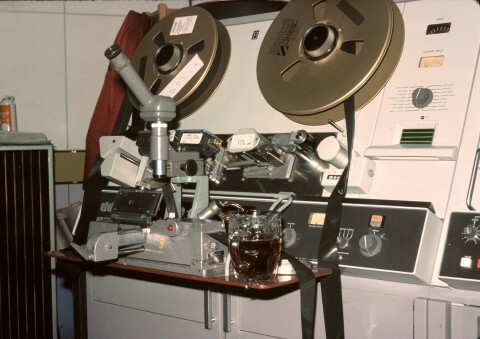 Jayne Savage: This is an Ampex VR2000 in VTB with a half drunk pint spoiling a perfectly good shot of a splicing block – Tim says. The splicing block lives on at the Drama Village.